Rock Resurrection Art : Post cards going out in the mail! Post cards going out in the mail! 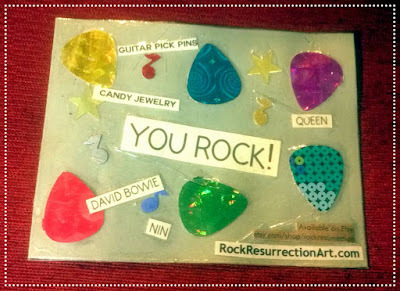 If you see this shinning guitar pick post card in your mail -- you're in for a treat! Currently all my customers are getting sent this promotional post card from yours truly. The post card has a special discount code. They come with a QR code right to my Etsy shop! Just scan the bar code with your phone and shop!